MTM2.com • View topic - Another soft body physics update. Another soft body physics update. Post subject: Another soft body physics update. I have been working a great deal on my soft-body physics engine for my modern monster truck game and have made great strides. 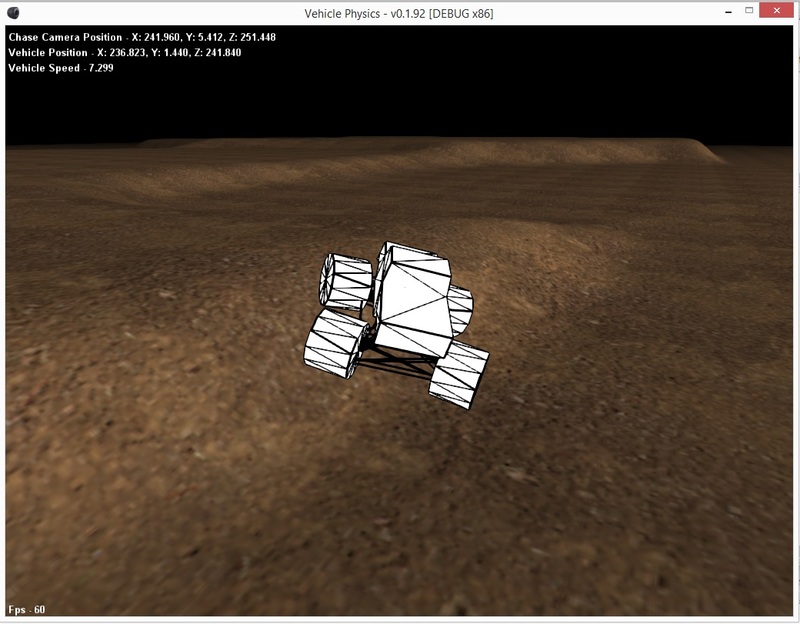 It now supports 4 wheel independent steering, a chase camera, ground is textured (simple) an a actual monster truck model. Still need to work on the model but hopefully this will give you guys a clue to how far it has come and what is yet to come. Here is a screenshot of the latest work in progress. Post subject: Re: Another soft body physics update. That terrain is looking neat textured, is the altitude bit-mapped like in MTM2? I am not exactly sure what you mean Kmaster, altitude bit-mapped? The terrain is a simple height map of any size (within reason, tested upto 2048x2048) the terrain wraps as well. As of right now it only textures the terrain with a single texture, but I mainly just did that to get an idea of how it will look. I am mainly focusing on the physics for now. As I have said before, it is not possible to reuse MTM trucks.. I have brainstormed over and over without a good way of making them softbody. So hopefully once I get enough complete some MTMers will come forward and help make tr?cks for it. I am seriously considering using OpenGL 3.3 or greater allowing to have multiple textures layered.. splatmaps. Similar to ROR. Otherwise the terrain will probably be textured similar to MTM. I've got the OpenGL modern version with the splat maps already up and running. Just haven't put the physics into it yet. Not all video cards would be supported though that a way. The older ones won't run it, so... I am not sure which way I am going to do it yet. Any input? I will release what I have so far tonight sometime and let me know what you guys think. Yes, that's the right word: "height map". every byte is translated to a height, just like in MTM2 which uses a 256x256 raw file as height map. Asigning a single texture to each grid wouldn't be that difficult I bet. Both concepts use a simple heightmap. It is by far the easiest and little memory footprint that away. I've already got a clone practically of MTM track engine, it loads MTM 1 & 2 tracks and renders them in OpenGL... I've considered making my own map format that is similar. Texturing each triangle/quad is no problem. The link for Project Monster is at the end. I am still undecided whether to use modern OpenGL and splatmap textures.. I'll post a screenshot of that here in a bit. I created a really crappy simple track before I went to work.. gonna redo it. It will show what is possible.